The cloud is a once in a decade disruption. IDC say the cloud market will be $44bn by 2013. Just as every company needed a client-server strategy in the late 1980’s and a web strategy in the late 1990’s every CxO needs a cloud strategy today. 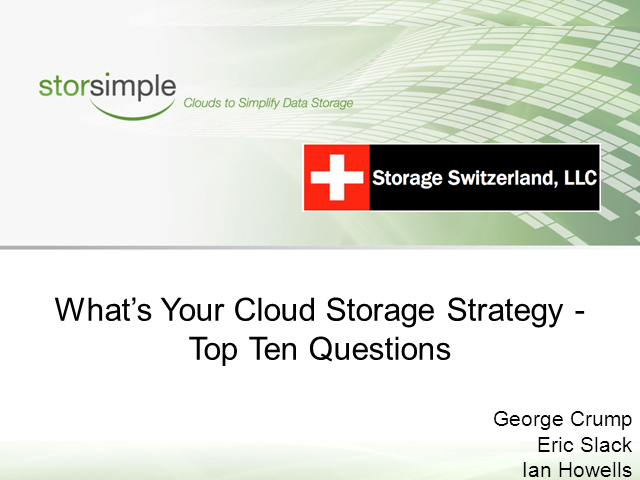 George Crump, Lead Analyst and Cloud Storage specialist at Storage Switzerland will be joined by Ian Howells, Chief Marketing Officer at StorSimple as they answer the top ten questions being asked by IT management about cloud storage. This presentation will look at the benefits of the cloud and potential strategies for embracing the cloud.